Wangford Community Centre situated in the centre of the village provides an excellent community facility. The modern single storey building has a large hall with stage. Double doors lead through to a smaller, fully equipped room with bar area. 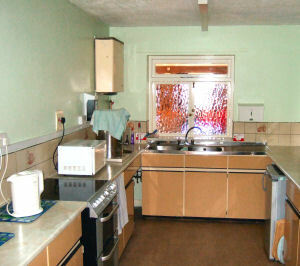 The fully equipped kitchen has serving hatches to both rooms. There is also a committee room ideal for smaller meetings and also fully equipped. The centre is fully centrally heated and there is easy disabled access, with a disabled w.c. There are full w.c. facilities. Externally there is ample car parking either on the tarmacadam car park to the side or in the grassed overflow parking area at the rear. A well maintained grassed area to the rear and side allows ample space for any outside function. The centre is run by Wangford Community Centre Management Committee who arrange maintenance and updating as necessary in order to ensure this building is an asset to the community. The centre bookings are managed by Gillian Rush who can be contacted on (01502) 578 062.